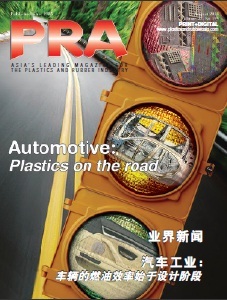 Recycled plastic is reinventing itself as a sustainable, durable and cost-effective material for building bridges and roads that used to be dominated by materials like bitumen, iron, steel and other metals, says Angelica Buan in this article. Post-consumer resin or PCR is no more a buzzword. The ubiquitous word may appear on a flap of a cereal box, at the bottom of a take-out salad pack, or on other plastic packaging. Utilising PCR in packaging and even in household goods is common, but now applications extend to larger structures like bridges and roads. Also, there is a rising demand for PCR, which goes back to how valuable plastic is as a resource. In the US, demand for PCR is forecast to rise 6.5% to 200,000 tonnes in 2016, with PET bottles as the leading source, says a report from Cleveland-based market research firm Freedonia. More rapid gains, however, are forecast for rigid plastics, film, and carpet as well as rLDPE, which will benefit from a rebound in the construction market; with growth also expected for smaller volume resins such as nylon, PP and PS. Meanwhile, PET and HDPE were the two leading resins used in recycled plastic products in 2011, accounting for over 70% of demand, says the firm. VinylPlus, the European PVC industry sustainable development programme, says that 514,913 tonnes of PVC was recycled last year, of which window profiles and related profile products accounted for around 45%. The target is to recycle 800,000 tonnes/year of PVC by 2020 in Europe. In the 1980s, Ohio-headquartered Axion International (which is currently under Chapter 11 bankruptcy) together with Rutgers University’s Advanced Polymer Centre produced a thermoplastic composite material made of 100% PCR and HDPE. Since then Axion’s Ecotrax composite railroad ties and Struxure composite building products can be found in infrastructures like girders, pilings, railroad ties and bridge substructures, as replacements for traditional materials like wood, steel or concrete. Unlike the glass fibre-composite systems, which were commonly used in bridges with decks during the mid-1970s, the TP-based bridge systems have shown to be inherently resistant to rust and spoilage, and require zero to minimal maintenance, says Axion. Trying out the material, the US Army made the first recycled plastic bridge at Fort Bragg in North Carolina in 2009. The bridge could carry a 71-tonne M1 Abrams tank and HS25 loads. The bridge components, including girders, pier caps, decking, railings and pilings, are made from recycled plastics. The following year, the dilapidating railroad timber bridges at Fort Eustis in Virginia were replaced with the TP composite. Europe has also harnessed the potential of recycled plastics as a replacement for timber and laminated products. In 2011, UK-based Vertech Composites (which was also a partner to Axion in the US for projects) , together with Rutgers University, Cardiff University , specialist bridge designer Cass Hayward and Polywood, built a 30-m footbridge across Scotland’s Tweed River. 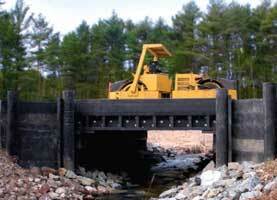 It is known as Europe’s first recycled material heavy goods vehicle (HGV) road-br idge. Some 50 tonnes of recycled plast ic waste went int o constructing the footbridge that took less than two weeks to complete. India’s economy continues to take off, with 7.3% growth expansion in 2015, which reportedly outpaced China. Along wi th the r i s ing economy, urbanisation is also peaking, and so is the waste produced. According to the Organisation for Economic Cooperation and Development, as much as 40% of India’s municipal waste remains uncollected and of the waste that is collected, almost none is recycled. 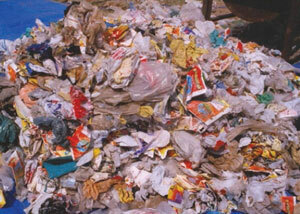 The country’s Central Pollution Control Board says more than 15,000 tonnes/day of plastic waste is generated. And although the nation’s per capita consumption of plastic is low compared with that of the US, it is expected to double over the next five years as India continues to develop . This poses huge environmental, social, and economic challenges. To deal with this , the Indian government is utilising waste plastic in roads, which are built within 50 km of the periphery of any city that has a population of over 500,000. The mandate not only eliminates idle plastic waste but also helps lower construction costs. 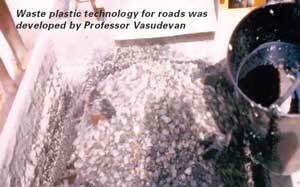 The expert behind the waste plastic road technology is Professor Rajagopalan Vasudevan of Thiagarajar College of Engineering in Madurai. Dubbed as the Plastic Man of India, Vasudevan says that waste plastics can replace as much as 15% of bitumen in asphalt. Almost all types of plastics ranging from bottles and acrylics to shopping bags and wrappers can be used. Another advantage of Vasudevan’s method is its simplicity. The plastic waste material is first shredded; aggregate heated at 165°C and transferred to the mixing chamber where the shredded plastic waste is added. The plastic waste-coated aggregate is then mixed with hot bitumen, heated to 160°C, and the resulting mix is used for road construction. This technology has been used by the Indian Plastic Federation (IPF) to spearhead the construction of roads in West Bengal, Tamil Nadu, Karnataka and Maharashtra states since 2009. Later, the New Delhi-based Indian Centre for Plastics in Environment came forward to spread the technology across the country. 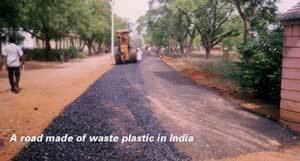 Almost 5,000 km of plastic roads have been laid in at least 11 states using Vasudevan’s technology. Meanwhile, the 780,000-populated Bhutan, a landlocked country at the eastern end of the Himalayas bordered by China and India, is following through with India’s initiative, via the Green Road project, initiated by engineer Rikesh Gurung. He says the project is expected to reduce the amount of bitumen imported from India by 40%, and cut the amount of plastic waste going into landfills by 30-40%. As a result of this project, Bhutan set up its first plastic recycling facility last year, and has piloted its first 500 ft-plastic road near Bhutan’s capital city of Thimphu, using more than 500 kg of plastic waste collected from a local landfill. However, Vasudevan, the inventor of the technology, says it remains to be seen whether plastic roads will suit the country’s high altitude and weather. Netherlands-headquartered Royal VolkerWessels Stevin, a construction services business, has developed PlasticRoad, which consists of 100% recycled material and is made out of modular panels of recycled plastic that snap together, which could be more environmentally friendly than traditional asphalt. It also features a lightweight design, faster construction time, is maintenance and corrosion-free as well as resistant to chemicals, extreme temperatures and boasts three times the expected lifespan. Other features are a hollow space that can be used for cables, pipes and rainwater as well as to integrate other elements in the prefabrication phase. For materials, the company says it could turn to waste plastics collected from marine litter or it could collect plastic waste at incineration plants in Germany and the Netherlands. Though it is still an idea on paper at the moment as the company needs to work out how the plastic surface will be safe in wet conditions, Rotterdam city council may pilot the new road surface. 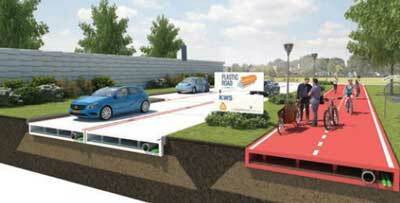 VolkerWessels says it hopes to lay its first plastic road within three years. A post-consumer study from the Berkeley University estimated waste generation to grow by 70% come 2025, driven by increasing population, incomes and urbanisation. The United Nations Food and Agriculture Organisation (FAO), in its How to Feed the World study, states that by 2050, the world’s population will reach over 9 billion, with about 70% of the population to be in urban areas. A circular economy is restorative and regenerative by design. 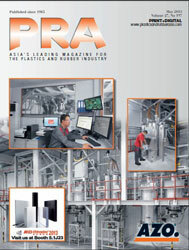 At a recent conference, Stephan Sicars, Director, Department of Environment, United Nations Industrial Development Organisation (UNIDO) said that the shift of emphasis to designing products and processes for sustainability offers the plastics and PVC industry many opportunities to capitalise on innovation, as well as consumer demands. He said that these trends will allow US$3 trillion in potential resource savings by 2030, amidst an emerging US$1 trillion global green market. Hence, the need to recycle plastic waste and put it to good use is growing.